The drive from Perth to Esperance is about 8 hours, and then the trek out to Israelite Bay another 4 or so, meaning we had to get up early and get going. 3AM was the chosen departure time, and we actually made reasonable time. Google Maps had suggested going back north to Brookton hwy and then heading down, but we had decided to head straight down the south west hwy through Williams and then cut across. By 7AM we were in Lake Grace, and looking for somewhere to eat. Everything in Lake Grace and Lake King was shut, so we pushed on to Ravensthorpe. After a quick stop at the café, we pushed onwards to Esperance. The 80 was averaging around 16.5 litres per hundred kilometers, which I can’t really complain about given the weight and the fact that we sat on 110km/h the whole way down, sometimes into a head wind. Esperance is a decent sized town, probably around the same as Karratha, and has pretty much everything you would need. After a quick fuel stop and getting some cash out, we headed along Fisheries road to the Tavern and road house at Condingup. We hadn’t eaten lunch at this stage, so decided to do one last fuel stop and grab a bite to eat. We were impressed with the food, eaten as we travelled further along fisheries road. This is mostly bitumen, and the last 20 odd kilometers are well maintained gravel. We were sitting on around 90 km/h when a big brown bird ( I assume an owl) took off from the side of us, right in front of the car up high, then nose dived down under the wheel. I was informed by the car behind us that it was well and truly dead. Shame. Right at the end of fisheries road, there are a number of signs asking for tyre pressures to be reduced and stating that there are no services beyond here. It says to make sure that you have plenty of water and fuel, as the distances are considerable. The track started off with a number of ruts and plenty of whoop dies that make your car go up and down. We could only sit on around 20km/h maximum. 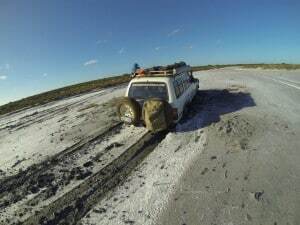 After a while things opened up, but the corrugations on the sand and the gravel were the worst I’ve driven on. We found sitting at around 40km/h was optimum to iron out most of the shock! 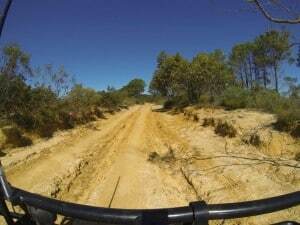 From time to time there were more ruts, which we slowed down and went around. A couple of them were still muddy, but we only dared to go through one or 2! Finally, we came out of the bush land onto the salt lake, which stretches for further than the eye can see. The tracks run around the side of the lake, and lead to Israelite Bay. After a few shots with the camera, we headed off, opting for the flatter tracks closer to the lake, which looked like they had been used by plenty of vehicles. It was here, that I made a terrible decision which could have been very serious; you can read about this here! 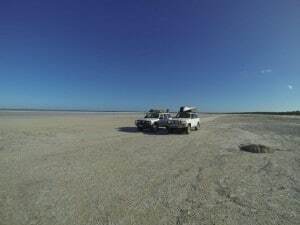 After getting un bogged and cleaning up, we headed to Israelite Bay, and found a nice campsite that wasn’t too far to the beach. We set both Oztents up, and then started getting dinner ready. Little did I know, the bogged 4WD wasn’t to be the end of our dramas. I went to set the burner up, only to find gas would leak out the emergency relief valve. This is the second time I’ve had issues with the Coleman burner; not happy! Luckily, I had packed the single burner. We put it on the gas bottle only to find that the jet was blocked. After pulling it apart, cleaning the jet out and lighting it up the flame was much stronger, and we were able to boil some water. None of us felt like doing anything serious for food, so we ate and crashed very quickly! I did however find some time to clean a bit of the disgusting smelly mud which had caked my 80. I was actually quite concerned about getting it off, considering the salt content in the mud. 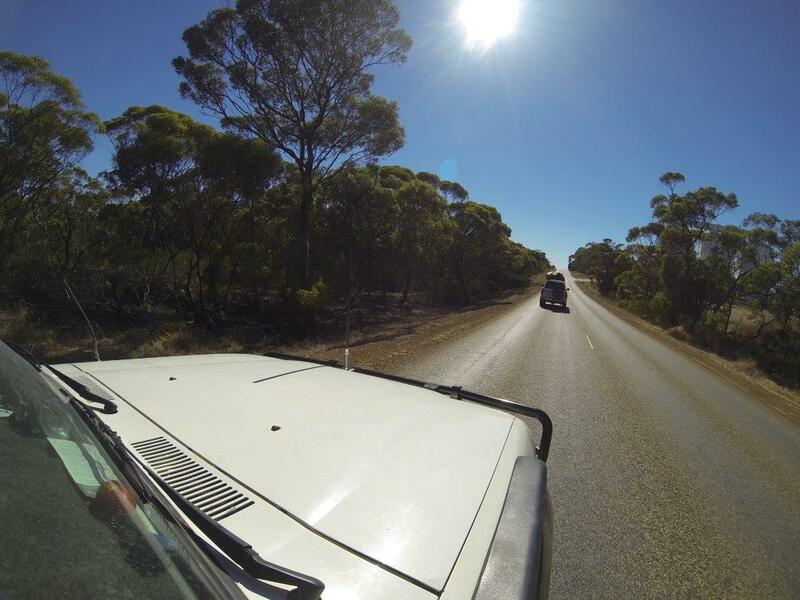 However, there wasn’t much I could do – we only had limited water supply for drinking and wasn’t about to drive 200km (and about 5 hours) back into Esperance to wash it off!